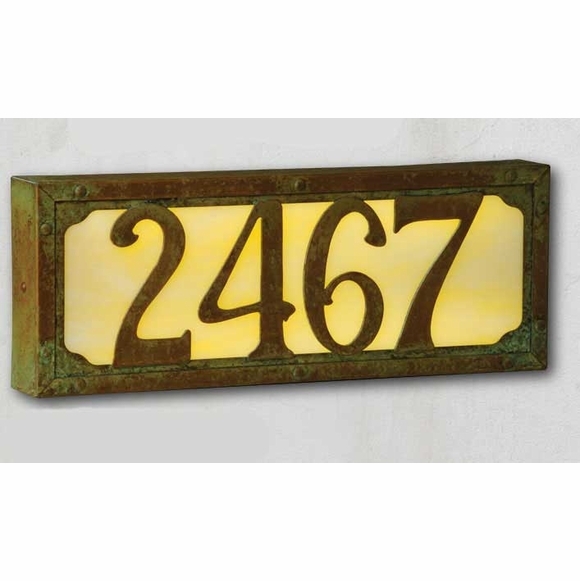 Medium Art & Crafts Lighted Address Sign - - possibly the most beautiful lighted house number sign you'll ever buy. Holds up to four numerals. Solid brass frame with rugged detailing. Two front-panel designs: Pasadena (small image) and Willowglen with the new verde finish and honey glass (large image). Select one of these five patina finishes: new verde, old penny, architectural bronze, warm brass, or textured black. Each patina finish takes 13 hand-applied steps and is then sealed with a clear lacquer. Unlike paint finishes, the patina actually darkens and becomes part of the base metal to create a natural lifetime-long look. Select one of these four glass panel colors to go behind the cut-out numbers: wispy white, champagne, gold iridescent, or honey. Dimensions: 15.125"W x 2"D x 6.125"H.
Uses 8 watts of power and lasts for 30,000 hours. Needs to be wired into your existing 120-volt house current or 12-volt "doorbell" wiring. Custom made and personalized just for you. Comfort House also sells three-number and five-number versions of this Arts & Crafts style address number sign. 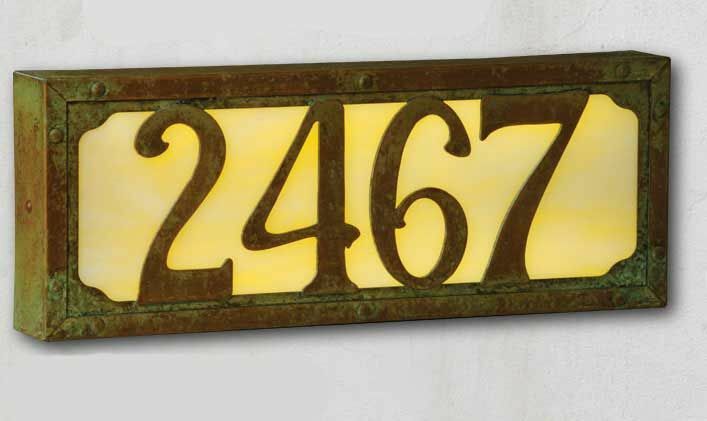 Arts and Crafts-style lighted address plaques are sure to brighten up your home like never before. Instructions for mounting directly to the wall. Instructions for mounting to an electrical box.